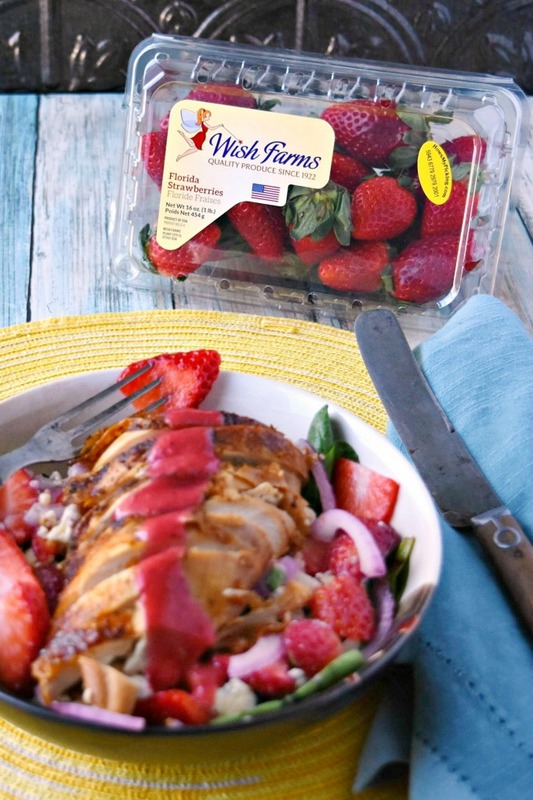 Using in season Florida strawberries, this Strawberry Chicken Spinach Salad is not only packed with strawberry flavor but it’s great a way to start the new year off right! Not only are strawberries in the salad, but they’re in the dressing, too! It’s winter here in my part of the big green ball we call Earth. Which I don’t mind. I love the chilly weather, wearing sweaters, and snuggling under a blanket watching holiday movies. I am a total winter hoor through and through. However, I can’t live in winter year-round. I mean, even the poles have seasons. Granted their spring and fall is probably super short. But there must be a weather change experienced there for a “winter” with REALLY cold temperatures and a “summer” where it’s like a few degrees below freezing or something like that. Anyone live in the poles? No? Okay. Moving on. Besides, I don’t think you can grow all the produce known to man indoors can you? Is that even possible? Would it even taste good? That’s one tangent I don’t think I really want to go down right now. Besides, with Florida strawberries, I don’t have to worry about that. I can get fresh strawberries from farms in Florida at my grocery store right now. I was like you. Well, maybe you weren’t like me. I was not very schooled in where my strawberries came from. If I wanted strawberries, I’d just pick up a blister pack at the store not really paying attention to where they came from. Then I saw the light. All those other packages didn’t have that great strawberry taste I was looking for. They didn’t have the sweetness we all know and love about strawberries. Finally, they just didn’t last as long in the fridge. After a couple of days they were starting to lose their shine. In about a week, they were obviously starting to go bad. If I didn’t time it right, I wound up just pitching them in the trash. I hate food waste. I’m a food hoarder, so throwing out perfectly good food was heartbreaking to me. Florida strawberries are shipped directly from Florida. Yeah, I know; sort of no brainer. But you have to spell it out for some people. At least that’s what I’m realizing at work. Anyway, that’s much closer those other berries from across the border. So, you know they’re going to be fresh. Florida strawberries have amazing flavor. And since they’re practically fat free and low in calories, I don’t have to worry about how many of those delicious berries I scarf down. They have no cholesterol and contain lots of folic acid that helps metabolize protein. I could go through one (or two or three) packs in one sitting and not only be deliciously full, but have no guilt what so ever! My doctor might even encourage me to do that! Because not only are Florida strawberries good for you, but they are one of just a handful of foods that are nutrient dense. Meaning, in one serving you get a TON of nutrients like vitamin C, potassium, and ellagic acid that keep you healthy. Florida strawberries can not only help fight cancer but heart disease and a few other illnesses. Finally, these sweet red delicious gems are high in potassium. Now, I know I’ve talked about the importance of this mineral before. But just to recap: potassium helps brain function and aids in reducing stress, stabilizes blood sugar and pressure, and enhances bone health. It helps reduce muscle spasms and disorders by strengthening them. Now that I’ve explained a few healthy benefits of eating Florida strawberries, let me dazzle you by telling you that Florida strawberries are in season RIGHT NOW!! I’m not kidding. I went to my local Aldi and picked up three packs from Wish Farms. When we were at Weis Markets picking up our holiday roast last weekend they had Florida strawberries, too. It always puts a smile on my face when I see that Fresh from Florida sticker and know they are fresher than any other berry you’ll find. I couldn’t put these delicious berries in just any salad. Yes, I did make a traditional chicken salad with strawberries. Maybe I’ll share that recipe later. But this recipe is about highlighting the flavor that Florida strawberries have which beats all others hands down. You don’t want to bury these babies into a mayonnaise and sour cream laden chicken salad. Oh no, my dear readers. You want to highlight these Florida strawberries all on their own. So, I decided to showcase them in a delicious tossed salad. 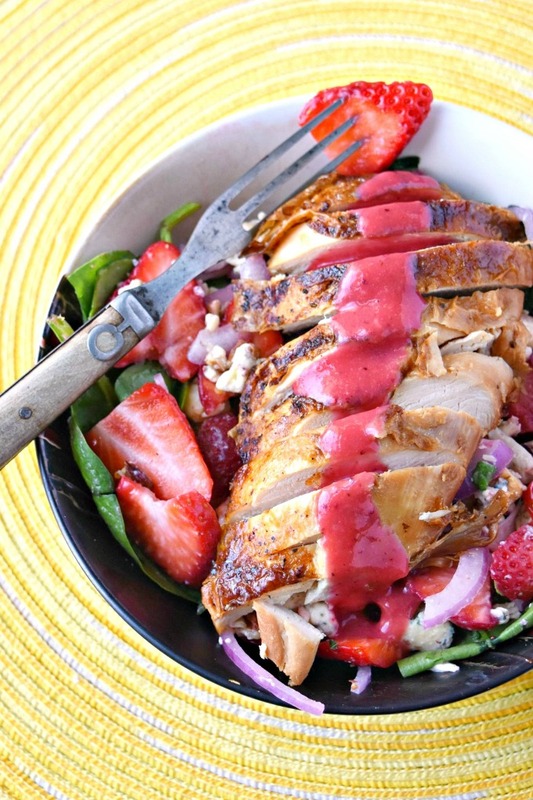 But not just any salad, one that is drizzled with a fresh strawberry vinaigrette. Oh, yes I did! I blended up some Florida strawberries into a healthy and flavorful vinaigrette to pour over my strawberry chicken spinach salad. And this salad is super healthy. It starts with a base of baby spinach that’s topped with low fat chicken breast, crispy red onions, heart healthy eggs, toasted pecans, and mineral rich crumbled blue cheese. After all those cookies full of sugar, gravies full of fat, and all the empty calorie cocktails, I thought I’d start the new year off right with this healthy tossed strawberry chicken spinach salad. I can just feel the pounds floating away by looking at it. All those layers of flavor in one bowl is just mind blowing. And, as if that wasn’t enough, the fresh strawberry vinaigrette just tops off this amazing salad. 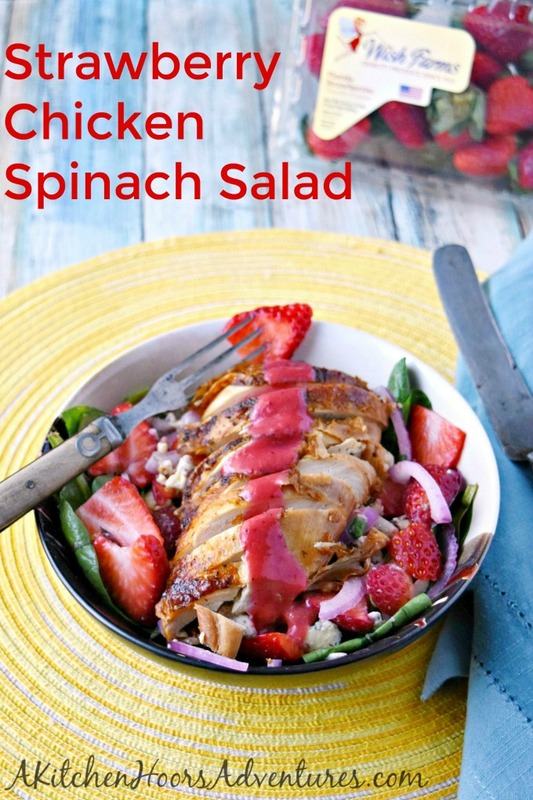 I couldn’t top this strawberry chicken spinach salad with just any dressing, you know. It had to be one worthy to be on top of this amazing salad. It had to be made with fresh Florida strawberries. So, I hope you’re like me and vow to eat better in the new year. It’s baby steps, like this baby spinach, that will help us eat right and feel better this year. And since Florida strawberries are in stores like Aldi and Weis right now, there’s no excuse not to pick some up. You won’t regret it. You’ll even thank me because these berries have the best flavor that need only be washed and then devoured. Florida Strawberry Growers Association share healthy recipes all the time! Make sure you follow them on Facebook, Instagram, Pinterest, Twitter, and YouTube so you don’t miss their sweet berries in delicious recipes. Since they’re made with strawberries, you know their recipes will be good for you! 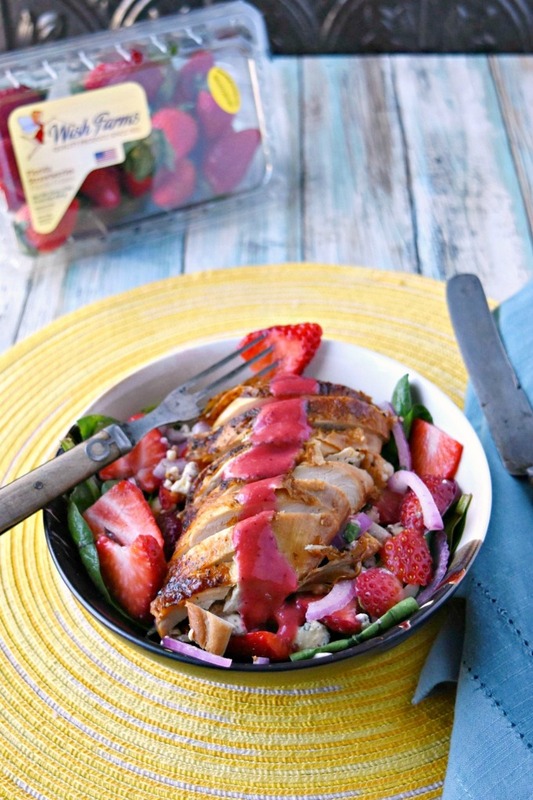 Using in season Florida strawberries, this Strawberry Chicken Spinach Salad is not only packed with strawberry flavor but it's great a way to start the new year off right! 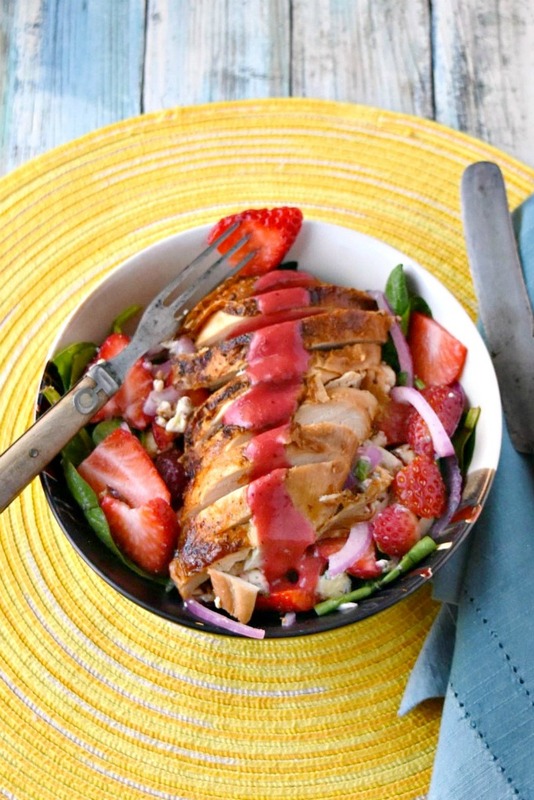 Not only are strawberries in the salad, but they're in the dressing, too! Combine all ingredients in a jar and shake until blended. Chill before serving. Store remaining dressing in an airtight container up to one week. Lightly toss the spinach with 1 tablespoon of the dressing. Add the blue cheese, red onion, and pecans and lightly toss again adding more dressing as needed. Fold in the strawberries and place in a salad bowl (or plate). Slice the chicken breast and place on top of the salad. Drizzle with dressing to taste and serve. Then try these recipes from the other participating bloggers. Gostei demais dessa dica de salada estava cheia de comer frango da mesma forma vou fazer assim acredito que está muito boa. This salad looks so incredible! I have to try making it! I hope you like it! I still have dressing left. I can’t wait to make a new salad with it. Luckily I don’t live at a pole either but in the desert it does get pretty hot. I too like winter but only for a bit. There is something to be said for snuggling under a blanket. Even in the depths of cold or when it is really hot here in the summer, strawberries are always a good idea! But even in the dessert, it can get cold at night, right? Arizona temps tell me night time can be brutal if you’re not prepared. Mmm This looks sooo yummy!!!!!!!!!!!! I want to make a some for dinner!!! The dressing along can stand up to anything you pour it on, but on the strawberry spinach salad, it’s amazing. That is one GORGEOUS salad!! That would pull anyone out of the doldrums of the winter grey!! This salad is perfection!!! Love all the bright fresh flavors. The strawberry dressing sounds really great too! Cant wait to try this! The dressing is SO GOOD! I could drizzle over any salad and it would be delicious. Thank you! 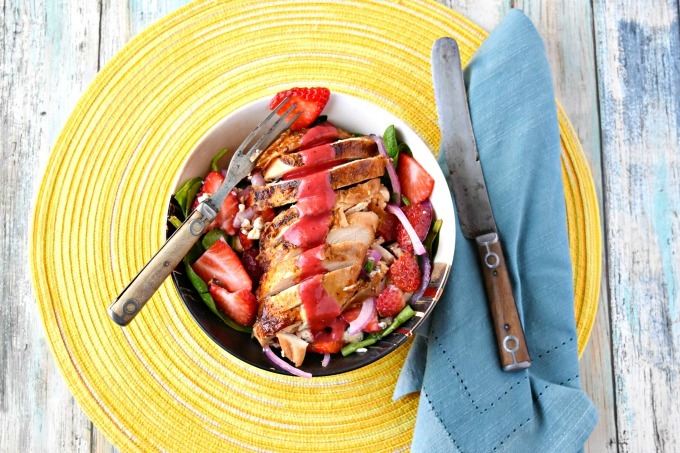 Love that you have strawberries in the salad and in the dressing – so much strawberry goodness all at once! Thank you! It is simply delicious. I love that we can enjoy strawberries year round. What a delicious and healthy salad. That dressing is so simple and it looks phenomenal! I agree! They’re super sweet right now from Florida. I hope you try this salad and love it as much as we do. Strawberries are my very favorite thing! When I was a kid we used to pick strawberries to make money in the summer and still I’ve never seen a strawberry I didn’t like! Your salad and the salad dressing are just delicious – I’d serve this up all year long! I didn’t know that! We didn’t go to strawberry picking farms. I’m tempted when they’re in season here. I’m trying to connect with my local farmer. This looks like such a tasty salad that would make a great lunch. Yum! Definitely! It would be a perfect lunch or light dinner. So much wonderful fresh Florida strawberry flavor here!! It’s hard not to highlight these delicious berries. I love that dressing combo. It makes the strawberry flavor pop! Yes, it does! I have more in my fridge, too. I can’t wait to get more Florida strawberries and make another salad. This gorgeous salad is a fabulous way of starting my new year off with tons of goodness! Thank you! It’s definitely packed with Florida strawberry goodness. This is my kind of salad and that dressing! This salad looks like something I’d order at a fancy cafe for lunch! Beautiful!!! Thank you! Confession, it was the second shoot. The first attempt didn’t look so great. This looks absolutely delicious! I cannot wait to make this dressing!